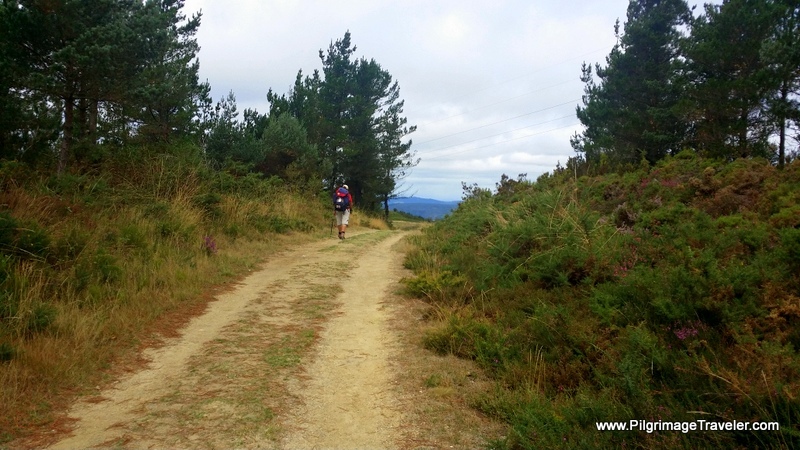 My day seven on the Camino Primitivo was about continuing to push my limits. ~ seriously pushing buttons and pushing limits. If only the above quote were not true, but I was to find out that indeed, it was. 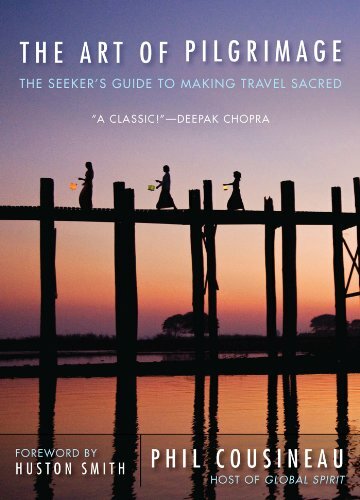 There is a time in everyone's pilgrimage when you believe that you can go no further, however, there is always a way to dig just a little deeper. 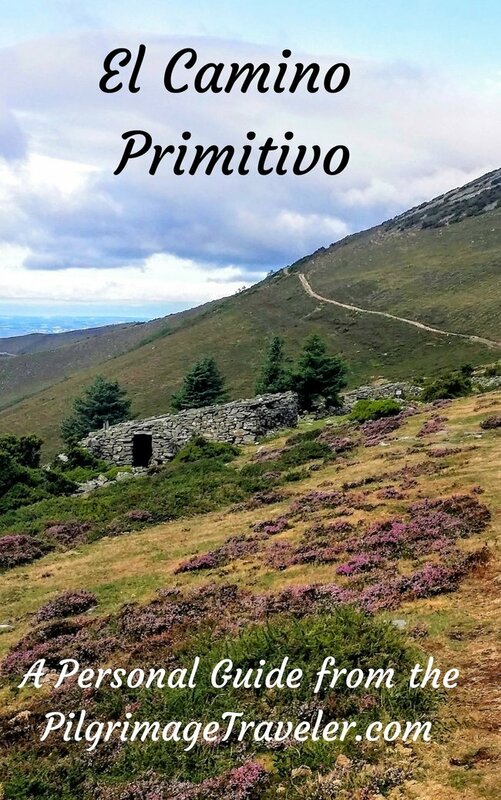 Day seven on the Camino Primitivo essentially follows alongside the AS-28 (while in Asturias) and then the LU-701, when crossing over into Galicia, as the map below shows. 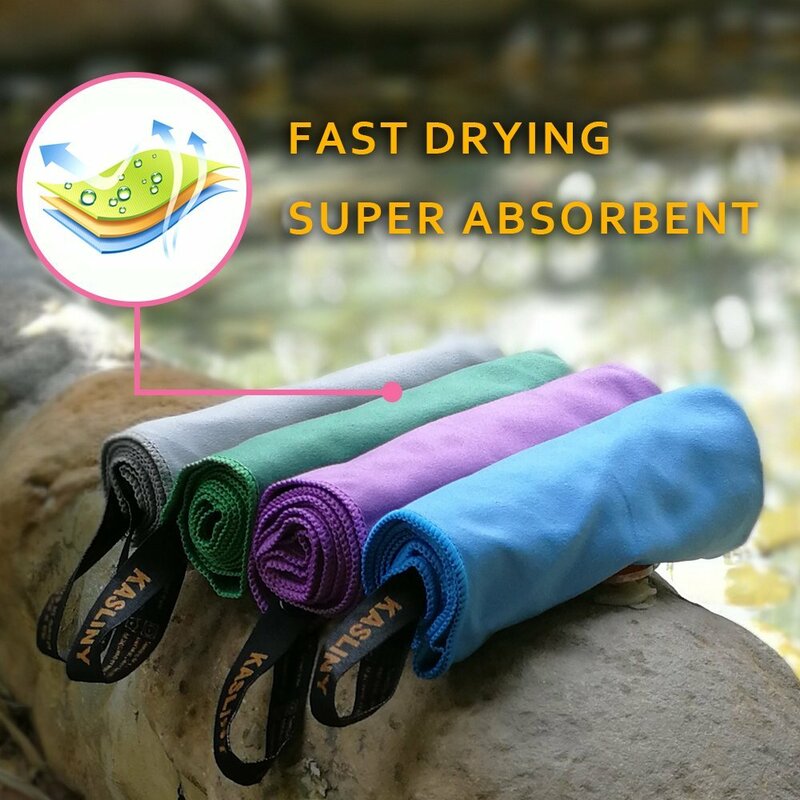 This was supposed to be a short, easy day for me; one that I sorely needed, since I was nursing a cough, laryngitis and bronchitis. Once again, my coughing during the night afforded less than an optimal night's sleep for me. The remote and Primitive Way is always full of surprises as I was to find out. There is no such thing as a "short" or "easy" day on it! Here is our interactive Google Map of the GPS tracks for our day. I have placed all the available accommodations, places to eat, and churches along the way for your reference. There are no cafés in Castro, but your accommodation will provide you with food for extra. Fonsagrada has everything you could possibly need, so I did not place the numerous places for eating on the map, only the one where we ate in the center of town. The elevation profile for our day says it all. 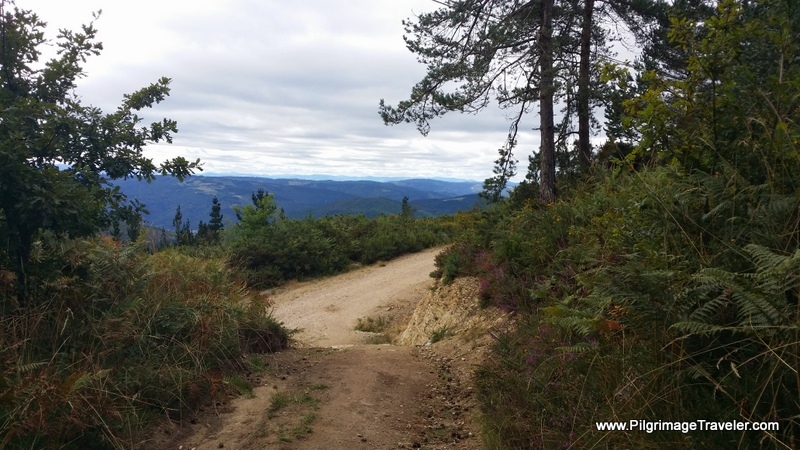 Starting from Castro, it is a strenuous climb of about 550 meters (1800 feet) to the high point, just before El Acebo. Then the meandering down towards Fonsagrada is very nice. 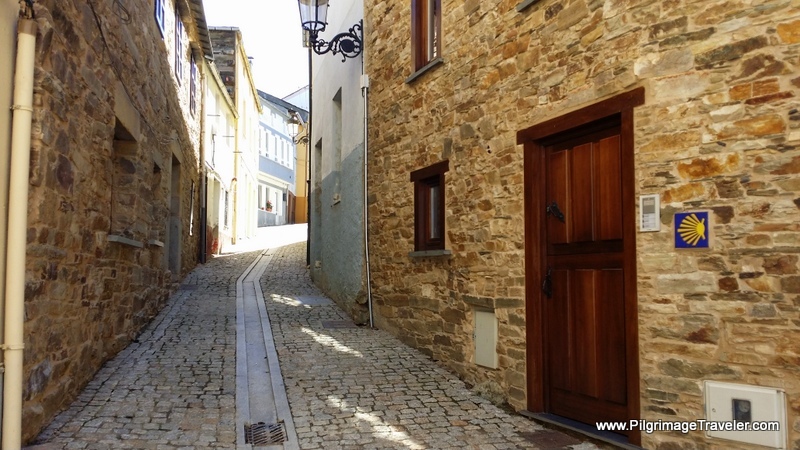 However the final stretch into A Fonsagrada is a surprisingly strenuous uphill and the roadway is ugly as you enter town. Part of the frustration is that you can see the city in the distance, long before you arrive! And so it is! The day started out nice enough in Castro. 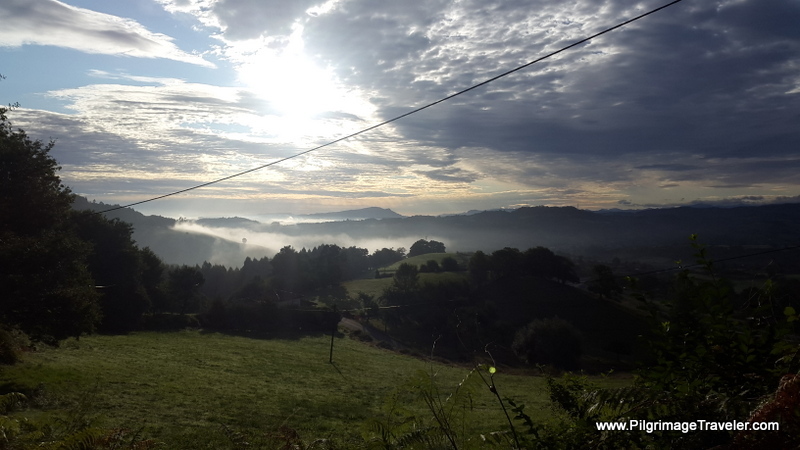 The sky was full of clouds, but no rain, which made for a beautiful sunrise from the Albergue Junvenil, sitting on top of the hill. I made preparations to leave with Glyvia, and my husband, Rich. 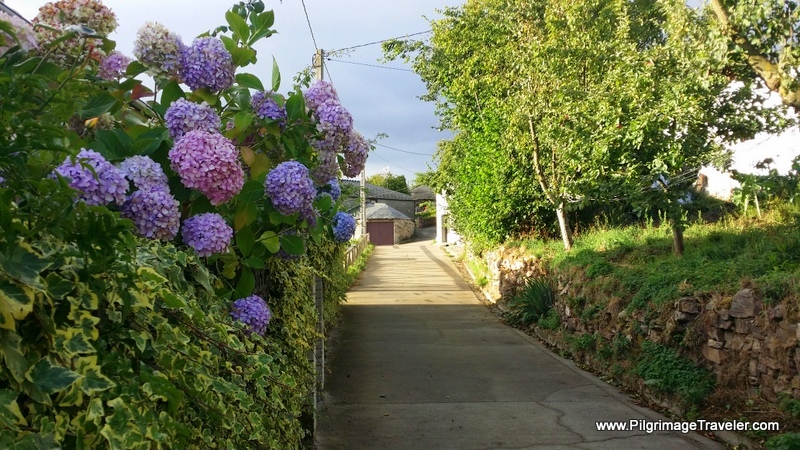 The Primitive Way walks along a lane framed by stone walls, through Castro and onward on this beautiful, gently climbing path. I had made a commitment to myself that I would spend the day walking with Glyvia, since she had been walking alone for several days prior. She enjoyed a good chat, so I intuitively knew she would enjoy the company. And frankly, I would as well. 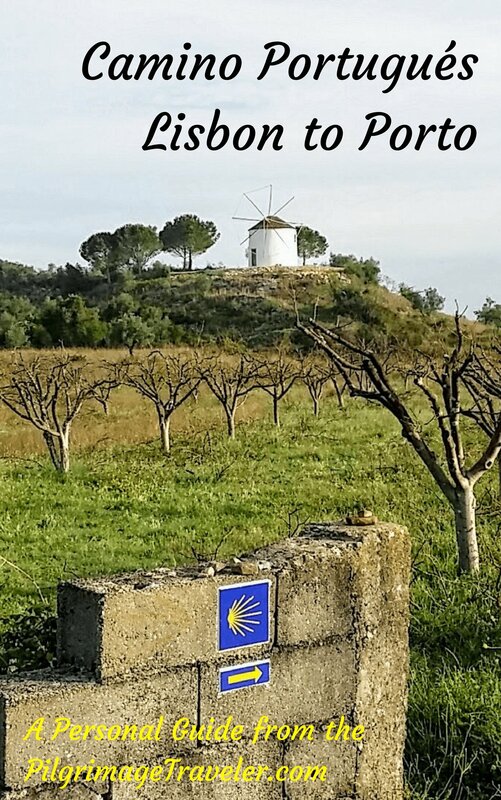 The Way parallels the AS-28, to the West and into the hamlet of Padraira, where we strolled by this historical site, the Ermita de San Lázaro de Padraira. 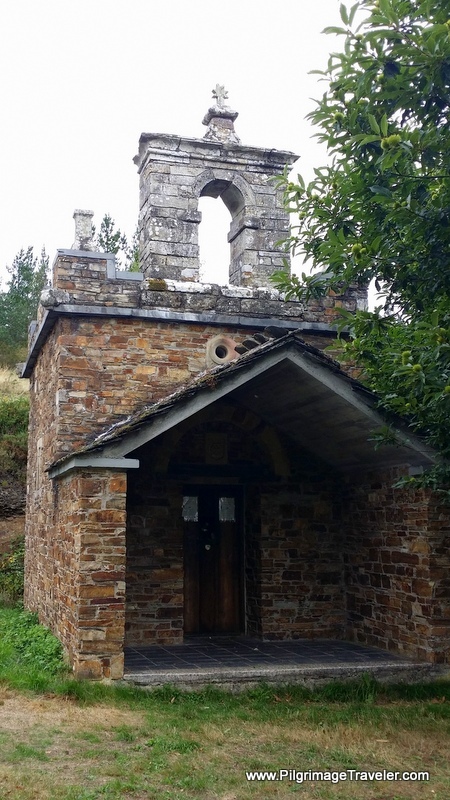 This chapel is the only remaining building of a group that were built for the care of lepers. 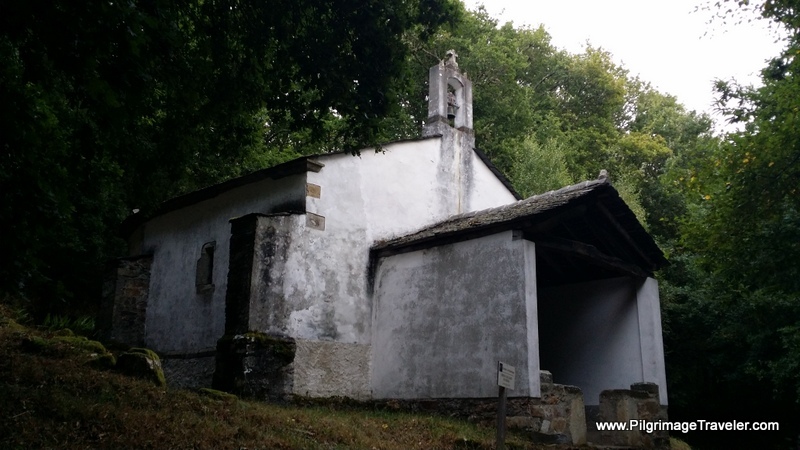 The sign on the Ermita states it had been re-built in 1689, however, I read where the leper colony mostly likely began before 1581, when the first record of it was documented. Even though I am a registered nurse, it felt eerie to me, paying homage here! I couldn't help having my mind wander to these poor, suffering souls. Still climbing onward, the path continued. 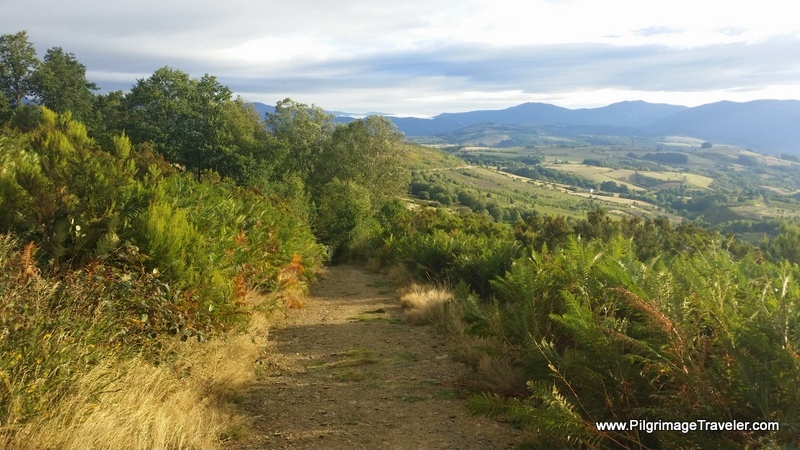 Here on day seven of our Camino Primitivo, the way leaves the nice path and joins the AS-28 just before taking you into Arrotón. The signs ahead, in the photo below, state that Punto del Acebo is 4 kilometers away. I checked the elevation map. Four more kilometers of climbing! 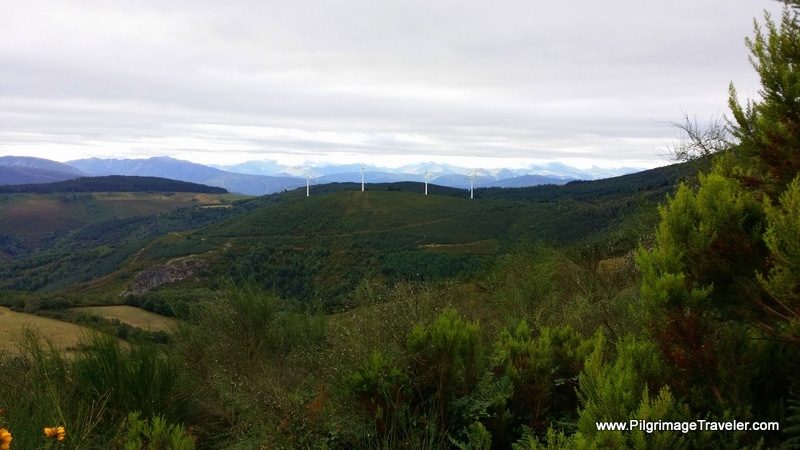 I saw the ridge of windmills ahead and remembered yesterday, day six and its climb. I was beginning to tremble in fear at the sight of windmills! Was that the destination?? 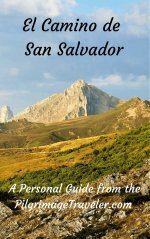 We had 1800 feet or so of elevation gain from Castro to Punta del Acebo. Onward! 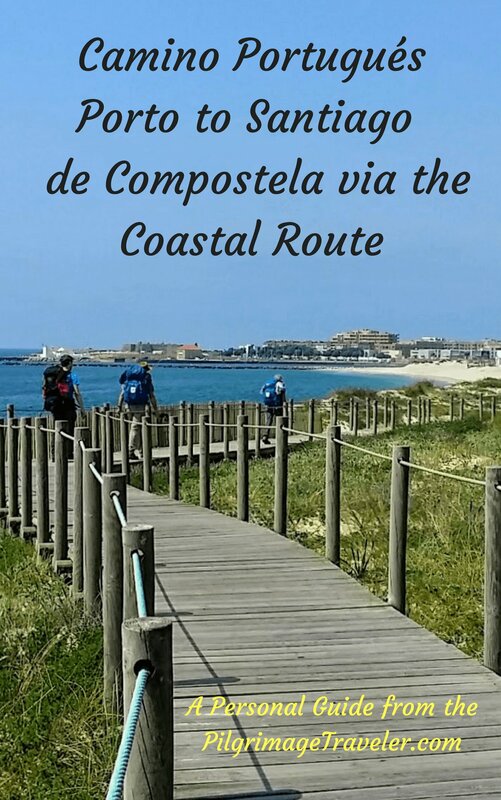 We walked on the AS-28 through Arrotón and to Peñafonte (variably called Peñafuente on some maps) for about 2 km of pavement, before turning off the main road into the town. The town is very quaint and inviting, with these interesting buildings just before the church. 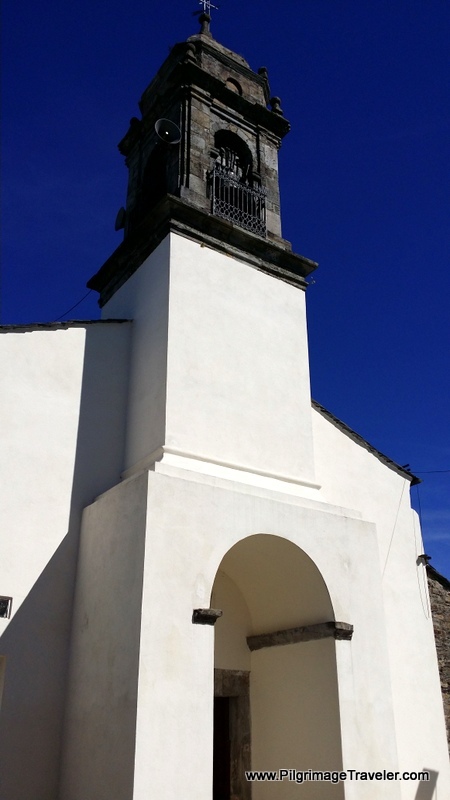 The Camino de Santiago travels past the Iglesia de Santa María de Magdalena de Peñafonte, the town church built in 1605. 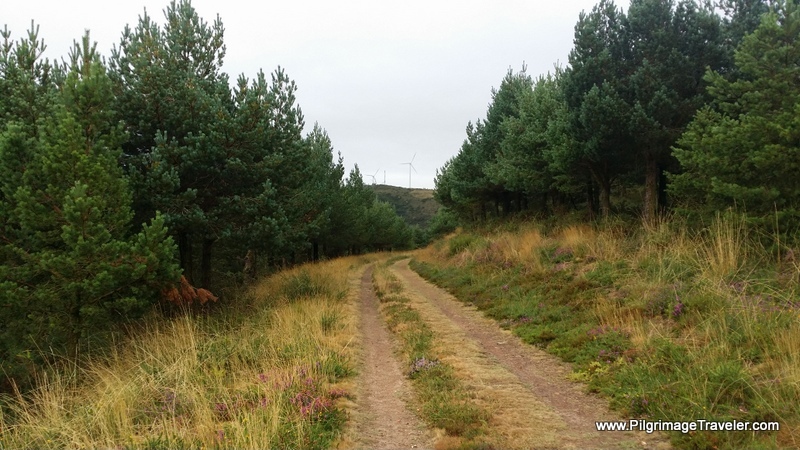 As we walked through Peñafonte, I took the following series of pictures our day seven on the Camino Primitivo. The sun was playing interestingly on the buildings as it came in and out of the threatening clouds. 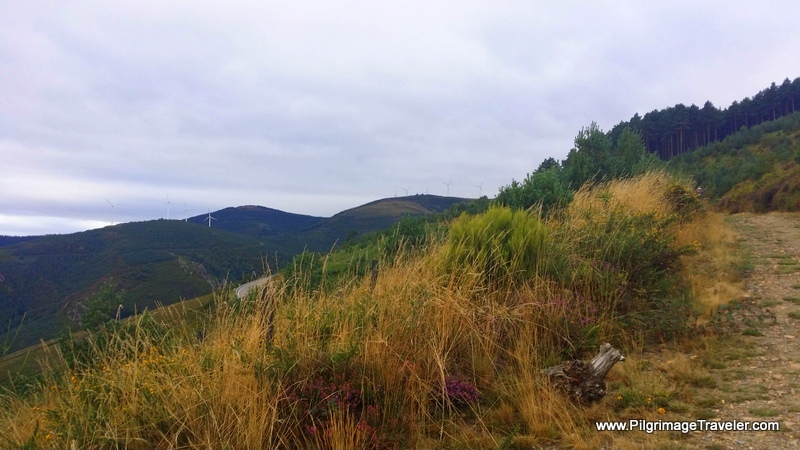 As we climbed up and out of Peñafonte, the views became sweeping, toward the valley floor below. In just shy of another 2 kilometers, we crossed over the AS-28 from the north side, to the south side, near Bustelo. 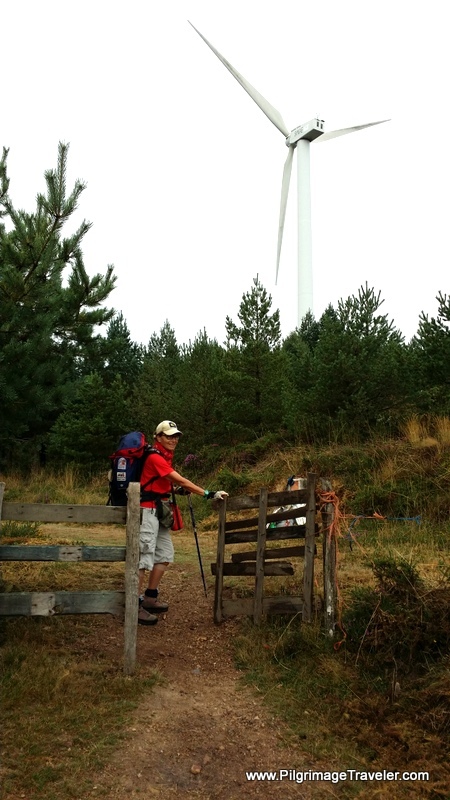 We continued the climb to the windmills on the ridge, just as predicted! A Windmill Close Enough to Touch! Open, sweeping views were everywhere! For now, the path levels and the climb is over. 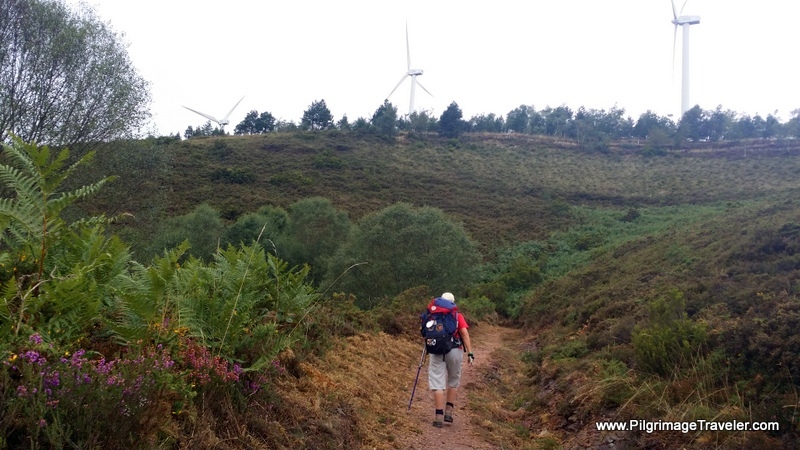 Just around 8 kilometers and two hours into our day, we crested the top of the ridge where we communed with windmills, and started our long descent. 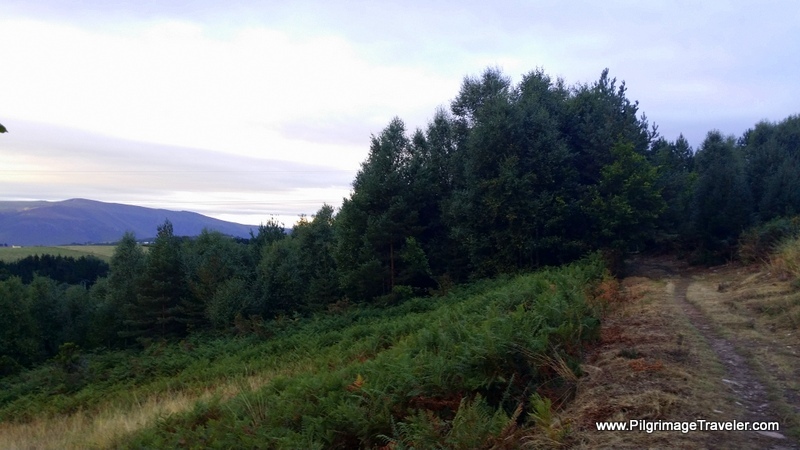 The other side of the ridge led us into a more protected forest path. 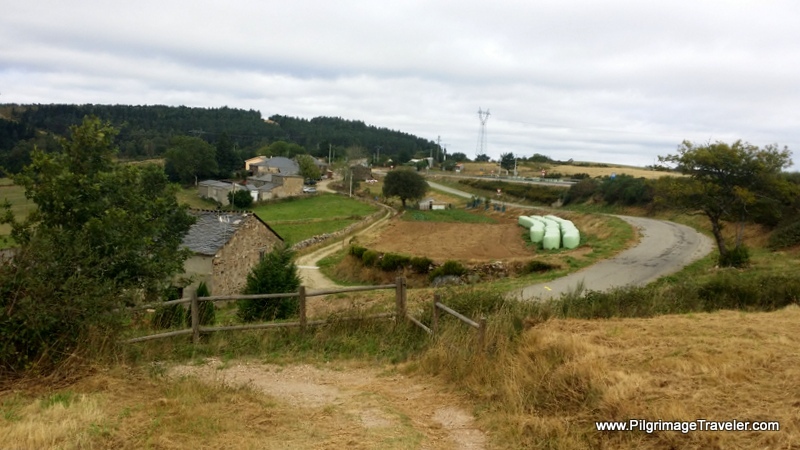 More than halfway to Santiago de Compostela, we crossed from Asturias into Galicia. This slate marker, below, denotes the border. 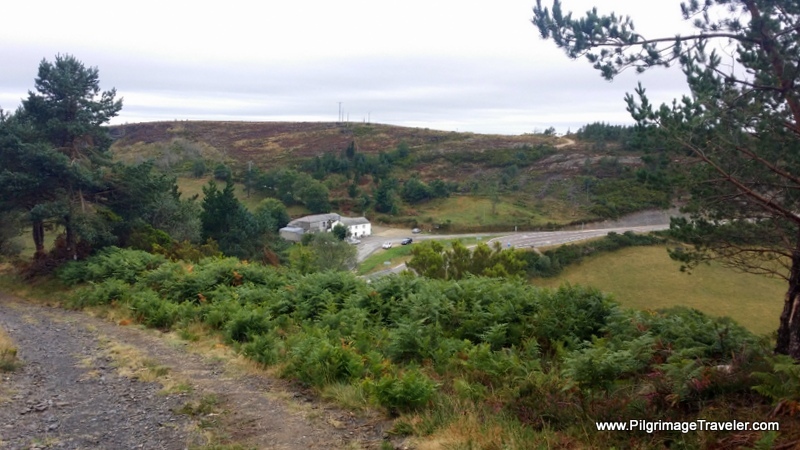 Having started our day at 0800, it was 10:00 when we crossed the border into Galicia, just 2 hours later. This view came into focus within 15 minutes of the crossing. At this point is was 10:15. This is the Bar Casa O Acebo, one of only two open cafe bars between Castro and A Fonsagrada. The next one was not for another 5.7 km. We decided to get a cafe con leche and a second breakfast, now, when it was available, after the long morning climb. 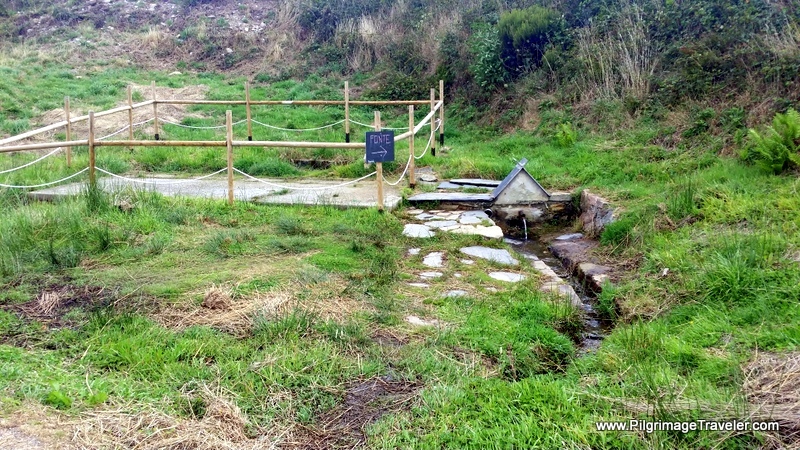 An important lesson on the Camino Primitivo, is that when the bars are open and available, take advantage of it! You never know when another opportunity will come along! 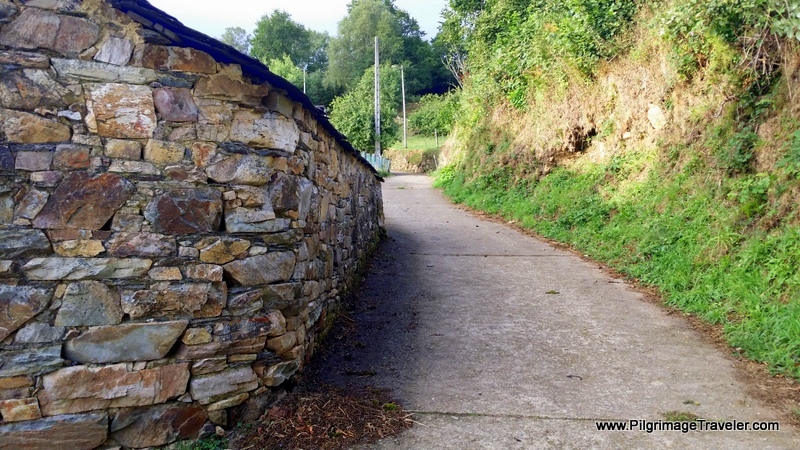 The path descends to the LU-701 (which was the AS-28 in Asturias). 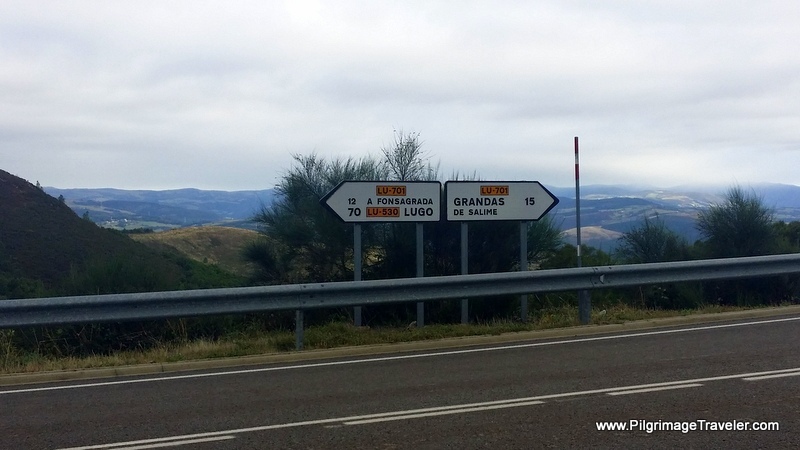 The sign shows that it is still 12 kilometers to A Fonsagrada. 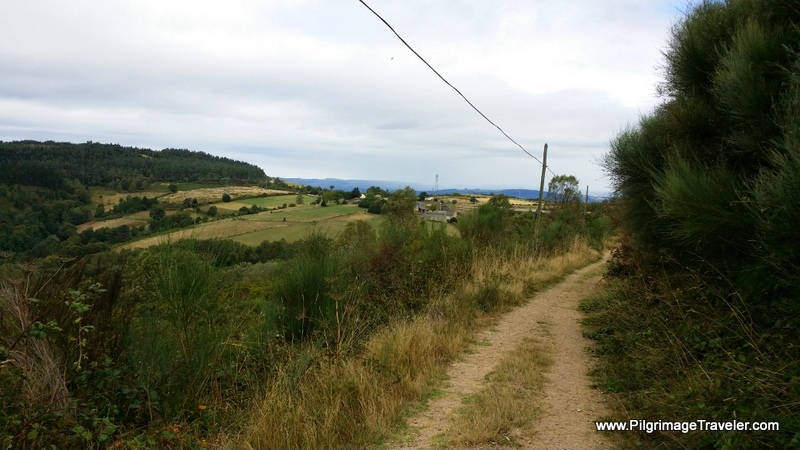 We were not yet halfway on our day seven of the Camino Primitivo, but a few kilometers shy. We paused at the waymark, a more embellished one than most. Glyvia was chipper and chatty for most of the way! After our 30 minute stop at the Bar Casa O Acebo, we climbed up a short hill on a path for more sweeping views. How lovely was this sight, especially lovely with a full belly once again. It was around this time that I grew weary of the ceaseless chatter that Glyvia and I were having. I needed some head space, and asked her if we could just walk together in silence. 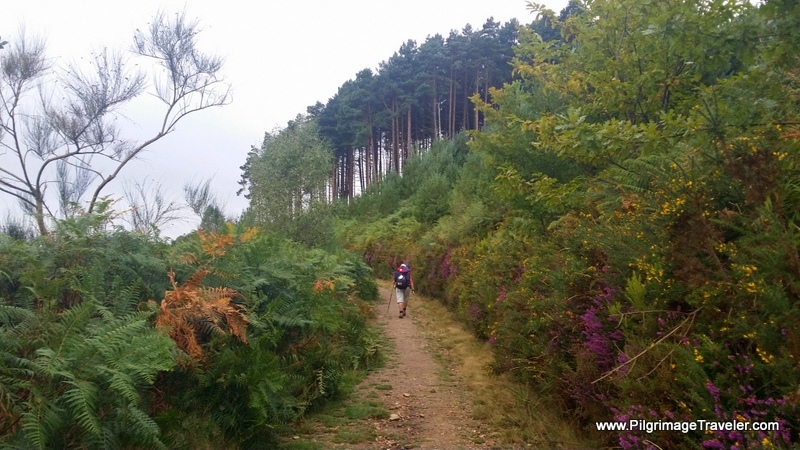 We walked on in silence, and I plugged into my Camino playlist. I needed some sort of inspiration, to keep on going. Rich had gone on ahead, to join others. We both did quite well, just walking together, but in silence. I liked this and was happy that Glyvia respected my desire. She was a true companion! 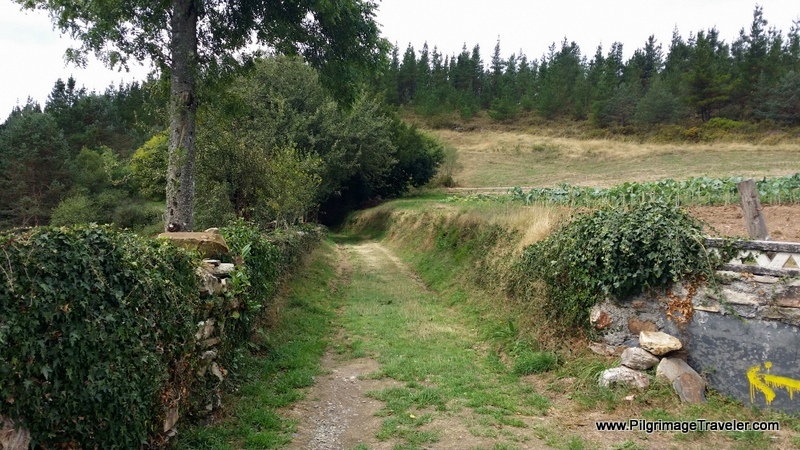 For the remainder of day seven on the Camino Primitivo, the way follows near and/or beside the LU-701, like this nice dirt lane shown below. The nice wooden fence gives a feeling of separation from the highway. 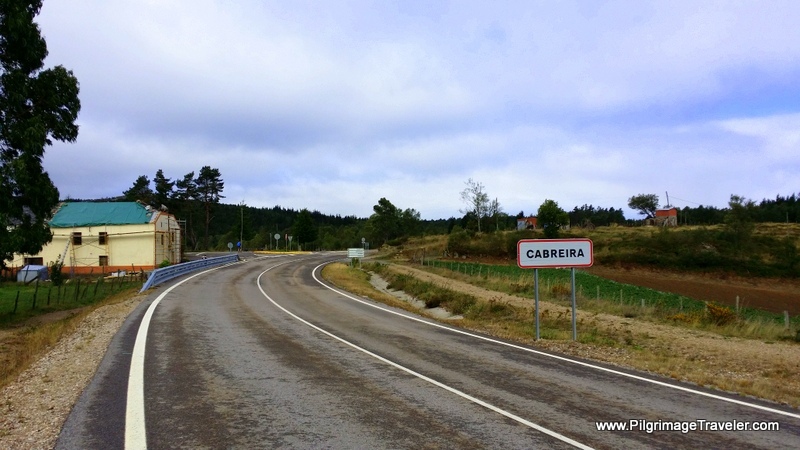 After two or so kilometers from the Bar Casa O Acebo, the Primitive Way follows, then joins the the highway at Cabreira. 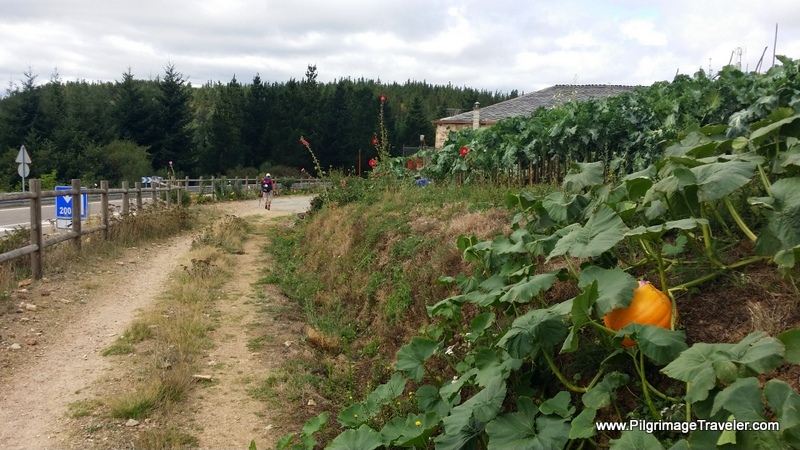 After Cabreira, we followed this path that wove around near the highway for another 2 km to, and through Fonfría. I enjoyed the walk through this hamlet but did not get the water from the fountain, so I do not know if it was safe. 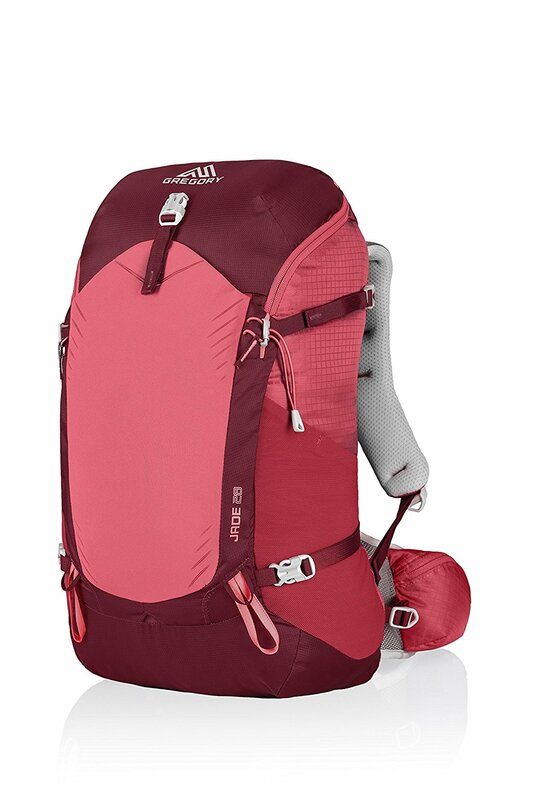 We usually carried our water for the day, in our hydration packs, so it was never an issue. 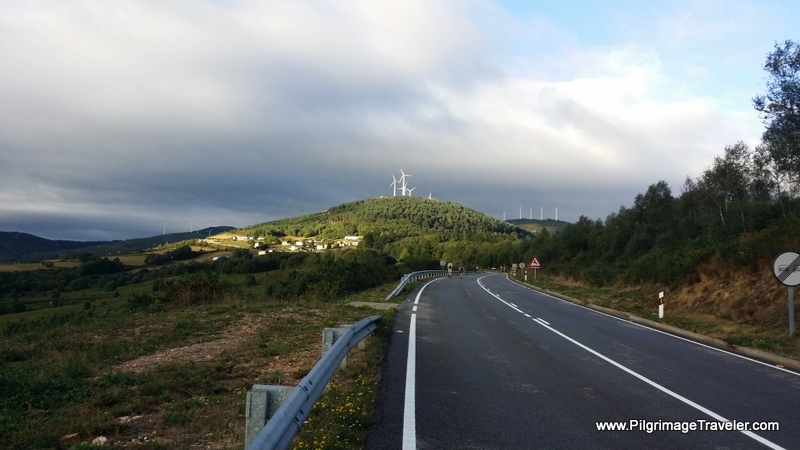 After strolling through Fonfría on day seven of the Camino Primitivo, we followed the highway for a short way, and then took a left off the LU-701 to once again to follow a lovely double-track lane. 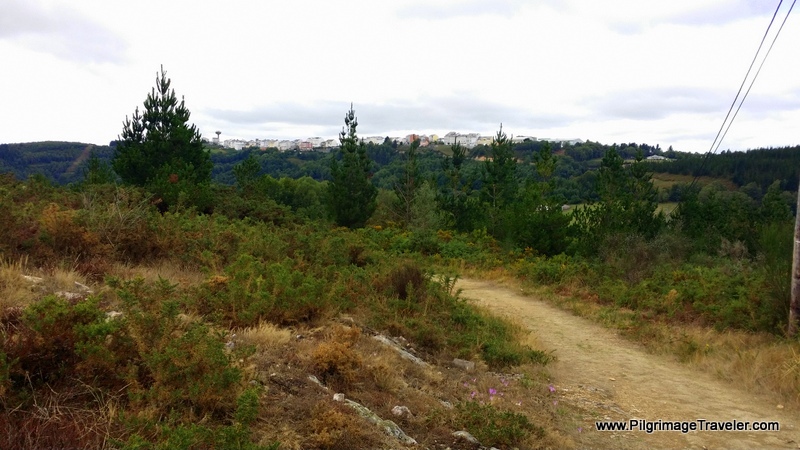 After only a kilometer and a half, the next town of Barbeitos can be seen ahead, in the the photo below. The next available cafe bar is here, the Quatro Ventos Café Bar in Barbeitos, right along the Way. This is the last bar until A Fonsagrada, another six or so kilometers away. One reader has told me that when he walked through, the bar had closed at 1600. Hopefully you will arrive here before that time if you need a bite to eat! We did not stop at this bar. Consider your own choice wisely! At Barbeitos, the Way crosses over the LU-701 again and follows to the north of the highway, as you can see in the photo below, if you look at the center of the image. 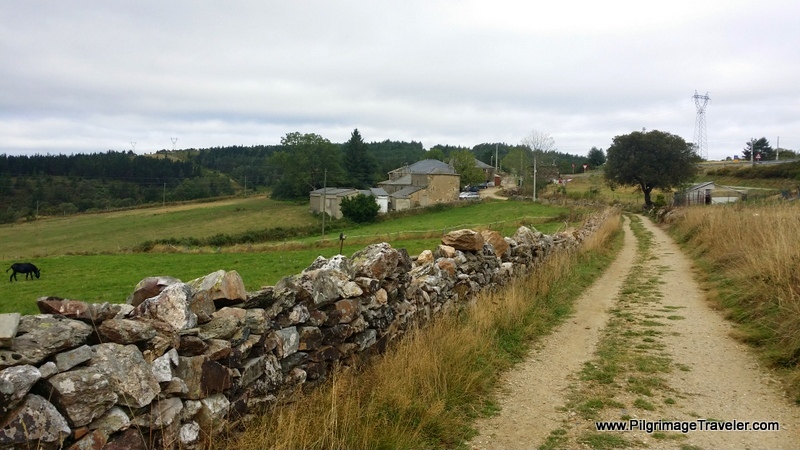 I was very grateful for very little pavement walking on day seven of our Camino Primitivo, despite the close proximity of the highway. Glyvia and I continued on together, once again chatting freely. I am not sure I felt very refreshed. My sinus-filled head was not very clear! 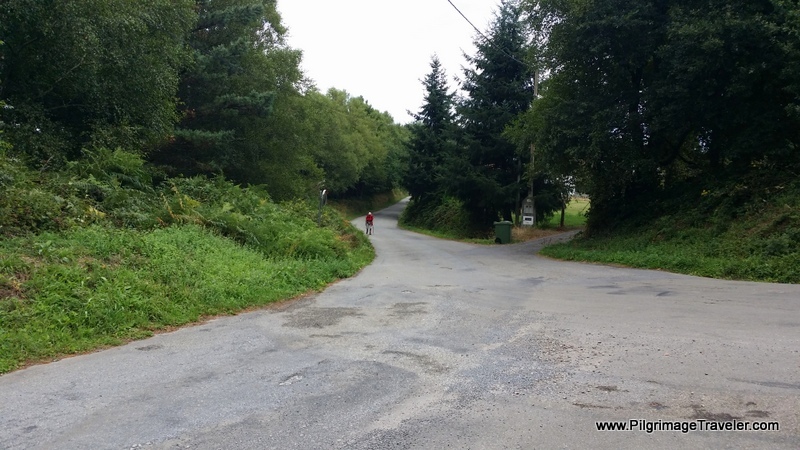 When the way enters the hamlet of Silvela, here in the photo below, it soon crosses to the south of the highway. 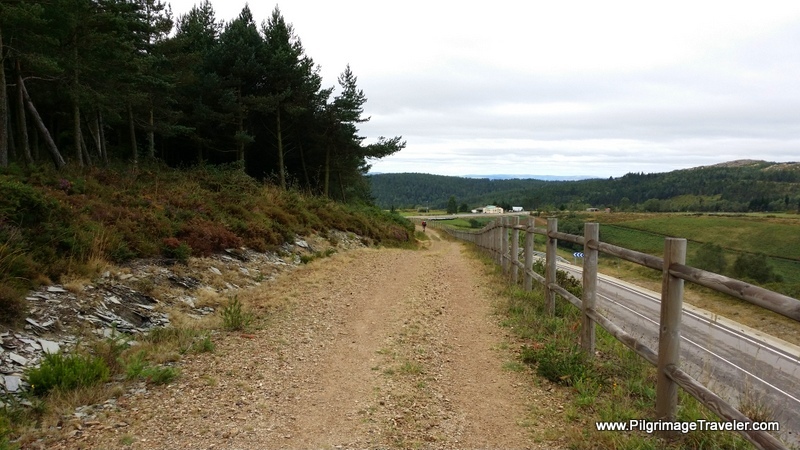 I loved how the Camino de Santiago, when following the highway continued to be demarcated by the lovely wooden fence. Once deep in the forest again, you encounter this lovely pilgrim's chapel in a clearing. Posted on the door was a sign that read, "The Blessed St. Bárbara, whose name is written in heaven, saves stores of bread and wine and watches over all pilgrims." I loved this prayer and spent a moment receiving this blessing from the locals, past, present and future! 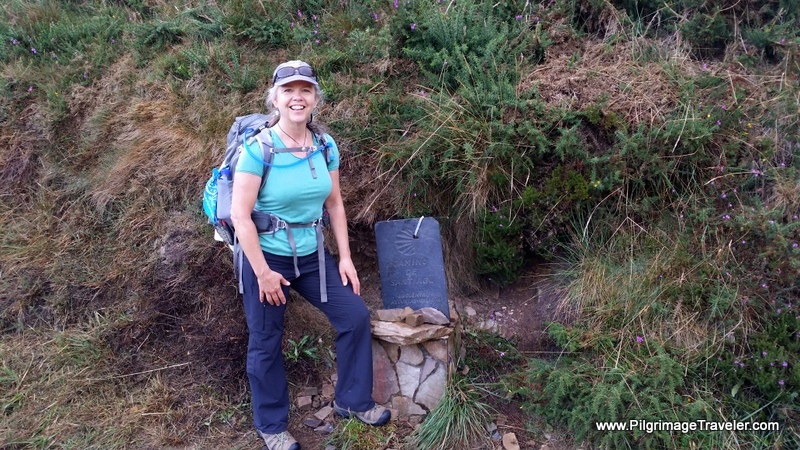 This was perhaps a highlight for me on day seven on our Camino Primitivo. 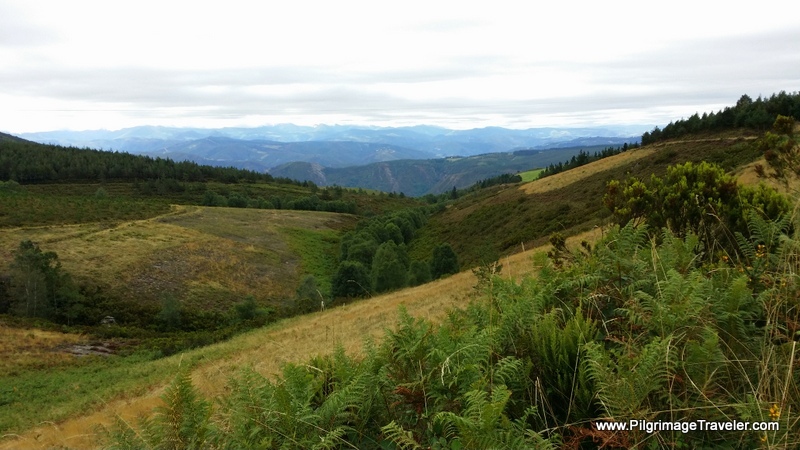 Climbing to yet another high spot, the vista of A Fonsagrada appeared. The town was about three kilometers from here and looked very close to me. I remember feeling great relief when I finally saw our destination. My "short" day had turned out to be not-so-easy after all. Looks were deceiving. 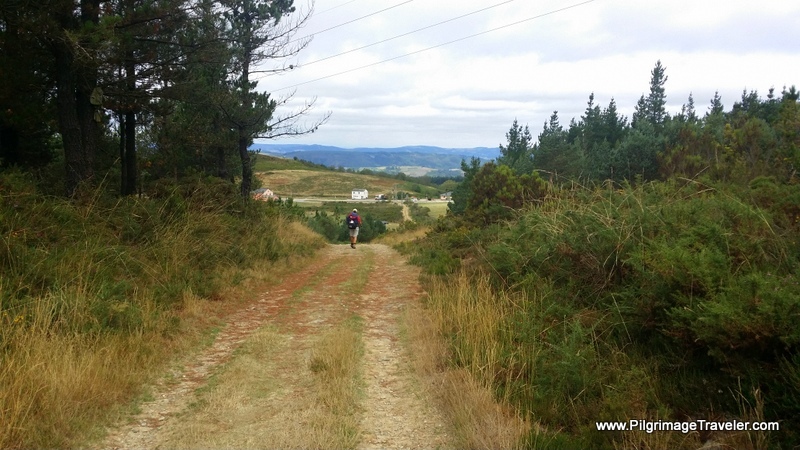 The hilly terrain we had to accomplish to reach A Fonsagrada, felt like the worst two kilometers of my life. 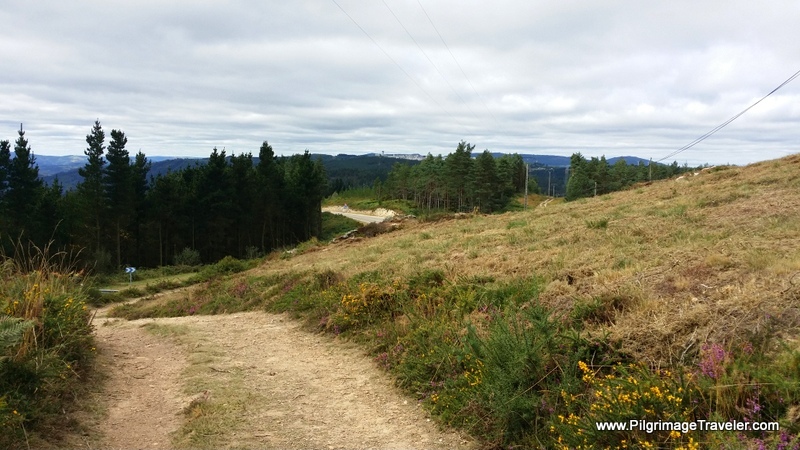 As you can see from the photo, there is considerable terrain between this point and the town ahead and lots of elevation changes. We first stumbled up a mountain, then down to the other side, to join the highway in the town of Paradanova. 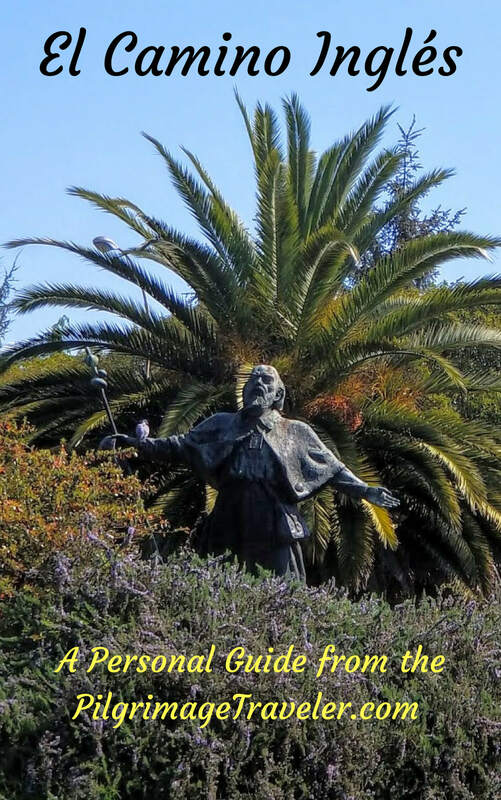 There is a chapel of Santa Cruz in this town, that I totally missed. I was so discouraged, hungry and exhausted by the time I got here, that I believe I was just putting my head down and grunting my way through it, seeing nothing but the road ahead. Rich, to be helpful, had taken all our food to carry in his pack, and he was nowhere to be seen. I had visions of him up ahead, already at the albergue, resting and eating. It made me really, really upset. No food and exhaustion, is clearly a button of mine that had been pushed! 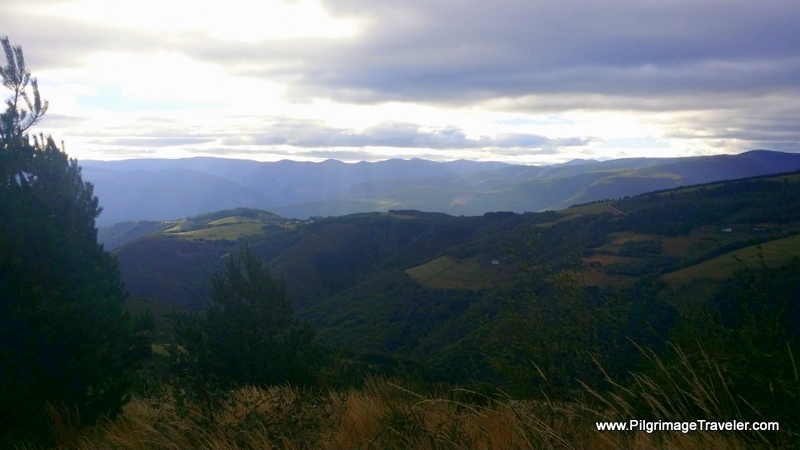 If you have read day three of my Camino Primitivo, you are most likely smiling at this! Plus the thought of Rich being ahead of me, also seriously pushed another of my buttons! Yes, this is also a bit of a theme for me. I rationalized that I wanted to be in the company of my best buddy, and indeed this was partially true. I was also wallowing in self-pity. Glyvia, my kind hiking partner offered me her apple to assuage my hunger, but I was so close, I didn't want to stop. 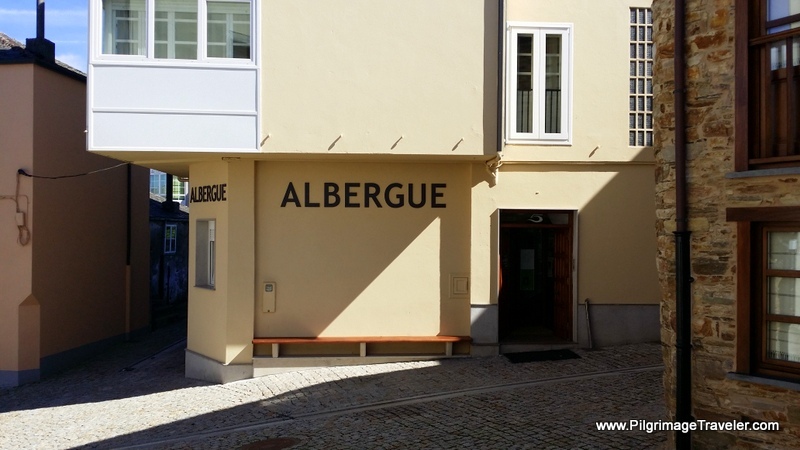 I preferred to slug on through until the albergue. I think I also wanted to stew a bit. Perhaps it helped to power me on! I sure know that I was quite upset. When I listened to my voice journal for the end of this day, the steam was really coming out my ears! Thank God for my voice journal!! When we reached the outskirts of town, we joined the pavement off a side road, which I did photograph below, because I think this is all I saw! Nothing but negative. The Way leads you around to the north of town, up a long hill and by a large lumber mill and into a not-so-nice industrial area! I wondered at first where on earth we were going to! This entrance into town, in my exhausted mind was quite ugly. The entire trip through town, was pushing uphill on pavement. Argh! I was not in a good state of mind. To get to the center of town, all you do is head for the church steeple in view ahead. 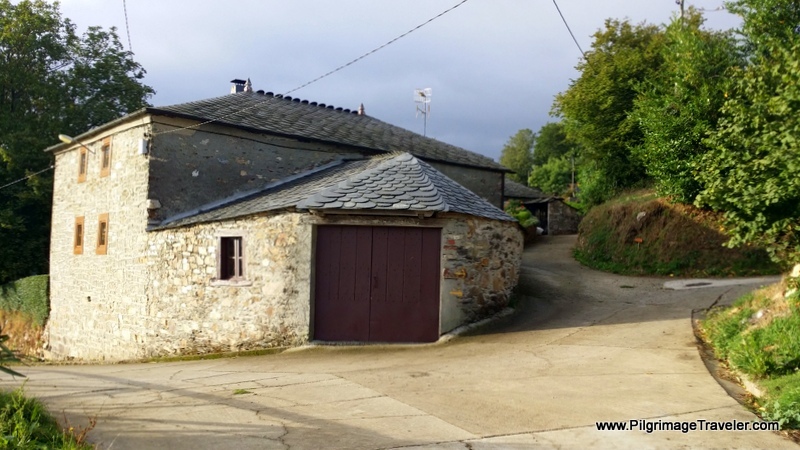 The first accommodation you pass by is the private Albergue Os Chaos on the north side of town and steps to the east from the Camino. Next is the Pensión Casa Manolo, right along the way before arriving in the center. Finally we arrived into the center of town, a lovely and inviting place. 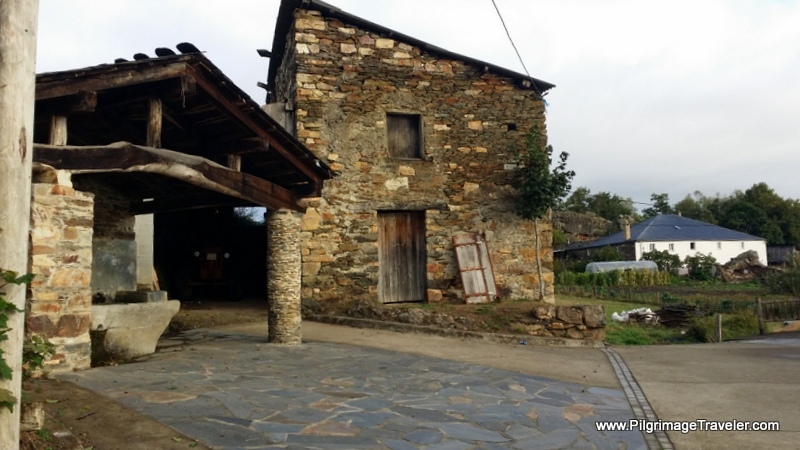 Below is the Albergue Hostal Cantábrico where we stayed, a modern and very well-equipped place right along the route, just to the right of the church off the main square. The Primitive Way continues right outside the door of the Albergue Hostal Cantábrico as you can see from the waymark directly across the street. 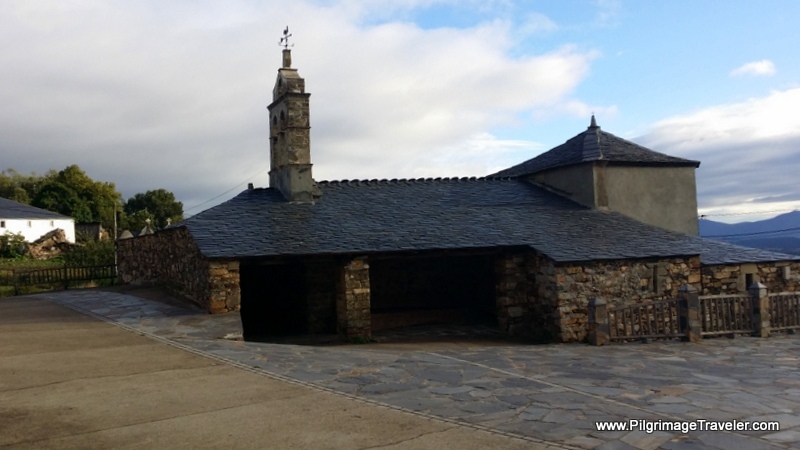 There is also a brand new municipal Albergue De Peregrinos Ramón Rodríguez and the Pensión Villalba in the center of town. The town church is worth having a look, since it is more beautiful on the inside and there is also a pilgrim's office close by. I seemed to have plenty of energy to explore around town, once I had rejoined my husband, and had a nice shower, and a nice snack! Our walk today had started at 8:00 and ended at 2:00, so it was a short day, relative to the others. 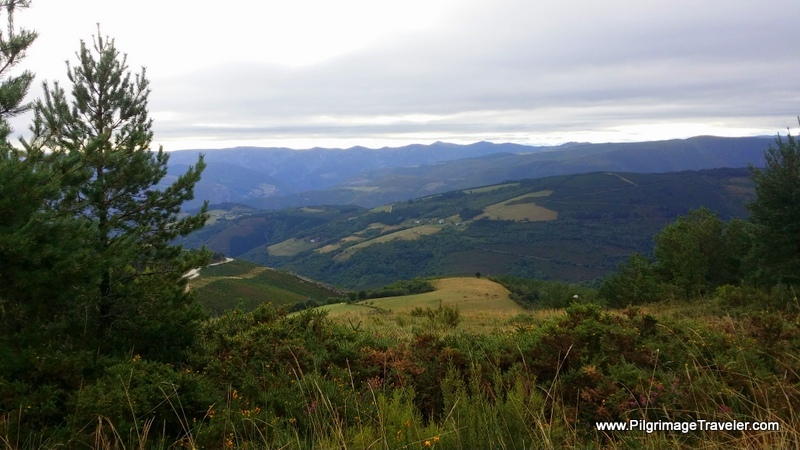 But to me, this day seven on the Camino Primitive was brutal for all it's hills. 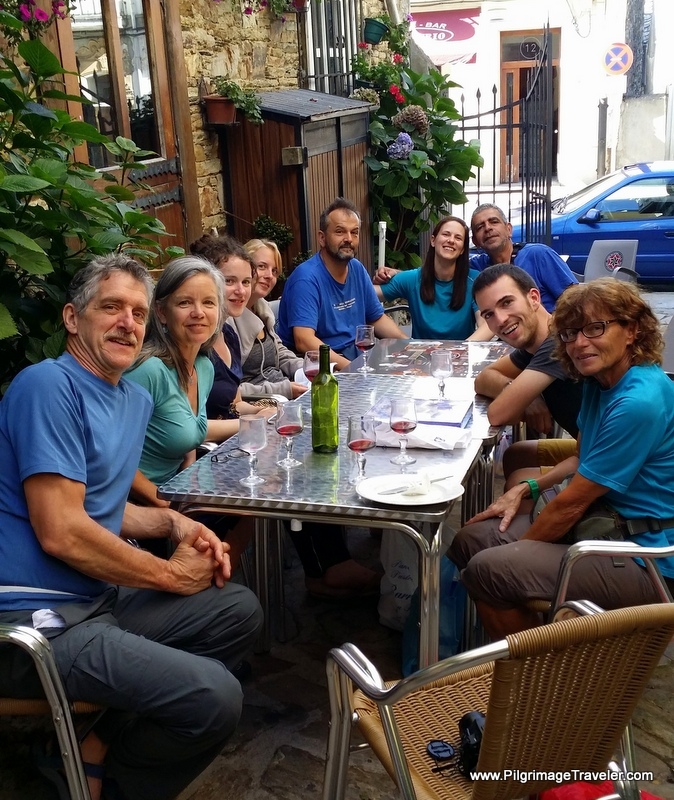 Our Camino family, who all eventually caught up with us in the albergue, gathered together in this outdoor café for a late lunch. If the truth be told, despite my buttons and my endurance being pushed, like any human-child, getting to the point of sheer exhaustion and hunger while feeling ill, is not fun. 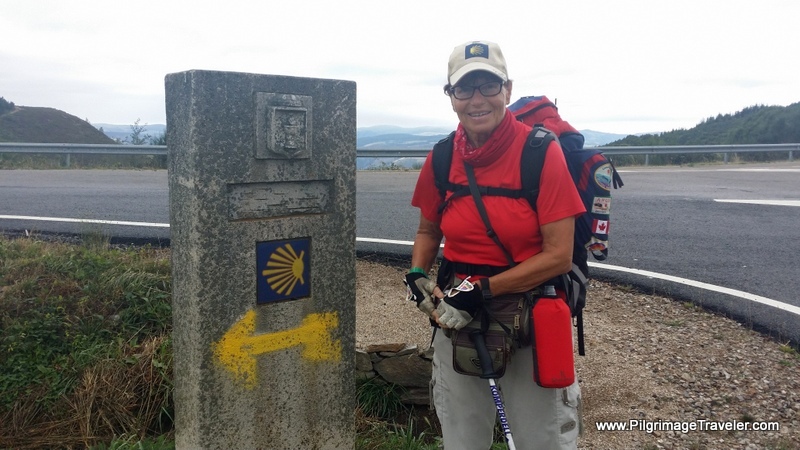 When I re-examine the hardships that can be found on any Camino, I realize that the struggle is part of the experience for sure, for whatever the Camino dishes out for you! The struggle was within myself, and fortunately I never took it out on anyone else. However, I was disappointed in myself too, that I just could not push myself to the extremes that I thought I should! After all, I was from Colorado! Without making too many excuses for myself, I really was subpar due to my illness, my lack of a good night's sleep and longing for the support of a close, loved one when I needed him most. I was very grateful for Glyvia that day. When I finally did catch up to Rich towards the end of the day, he was only minutes ahead of me, and was not relaxing and dining at my expense. In my exhaustion, the actual picture was not as ugly as I had made it. This reminds me of a saying, that my dear, now-deceased mother used to say to me, as a girl, whenever I was discouraged. She would say, "Things will look better in the morning." I can hear her clearly. And of course, she was right. Things always did look better in the morning. 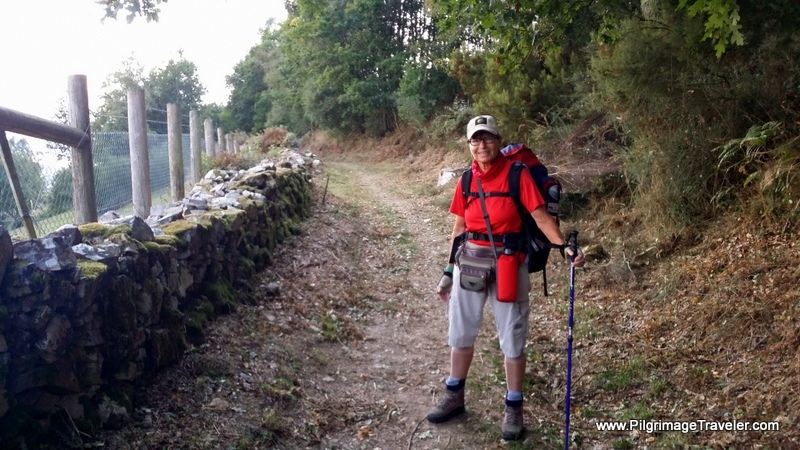 Exhaustion does strange things to a pilgrimage traveler, and I was no exception on this day seven of my Camino Primitivo. Things did look better to me the next morning, at the dawn of day eight, and I was able, once again, to get up the next day and repeat the process. 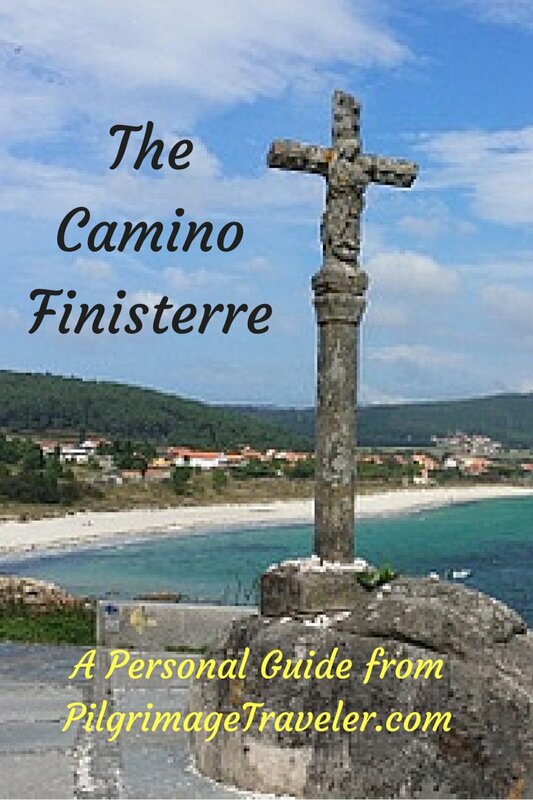 This is the Camino, get up and on each day, start anew. However, I would never let anyone underestimate the challenges that are found on the Primitive Way! The hills are relentless! And we even had good weather! Once again, while it threatened, it never rained. 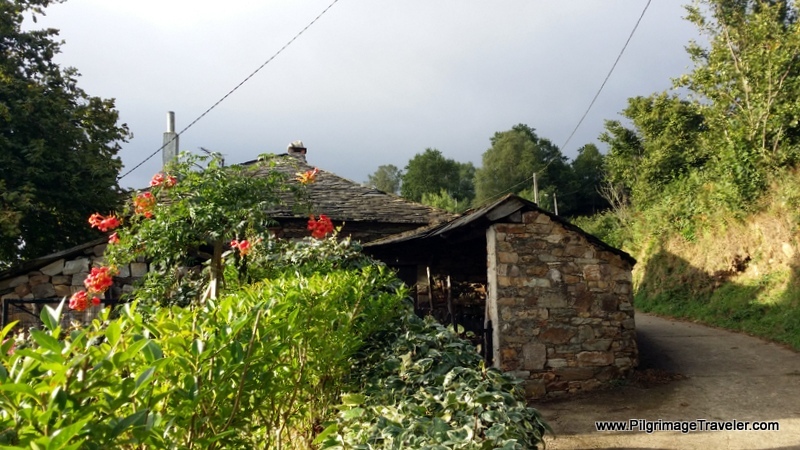 I shudder to think what my day seven on the Camino Primitivo would have looked like if I had to do this in pouring rain! 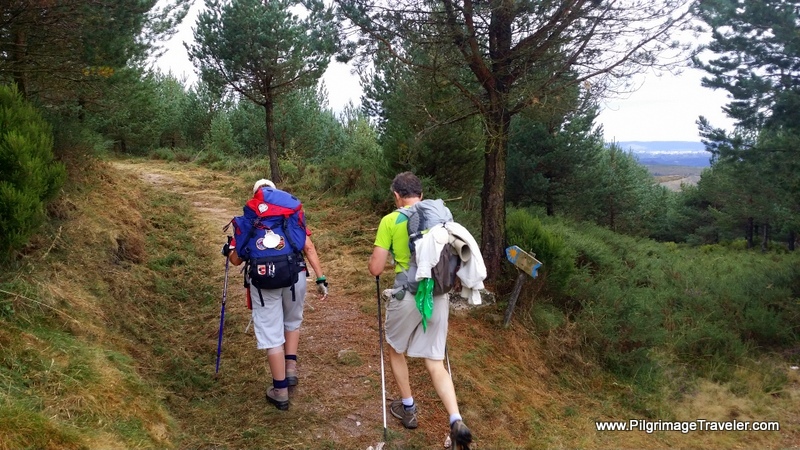 May your own day seven on the Camino Primitivo be a learning experience as you test your limits. May you recognize your own buttons and find the Grace to meet your inner struggles! May you kindly push your own limits, so that your boundaries are open, flexible and expanding. 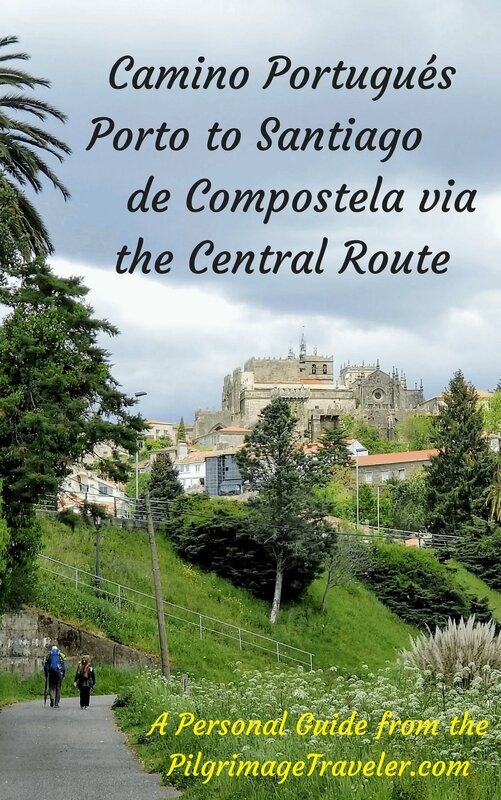 May your day seven on the Camino Primitivo be filled with only the lessons that will broaden your understanding of yourself! Buen Camino!